Today as we meditate on this Jesus conversation with His disciples we will try to understand who Jesus was and is, and why it is so important. Then we’ll look at three promises which are directly related to Jesus identity. Finally we’ll have a little joke, quite sad a joke. Who Jesus is, what three promises are attached to His identity and a sad joke. We may wonder why these answers. That’s what people thought. We can read in Mt 14 that ruler Herod thought that Jesus was John the Baptist who has been raised from the dead. That’s why His miraculous powers. Why Jeremiah? Because the prophet Jeremiah prophesied that the temple will be destroyed and it happen as Babylonians conquered Jerusalem. Jesus said something similar after He had cleansed the temple in Jerusalem as John describes it in his gospel account. “Destroy this temple, and in three days I will raise it up.” (Joh 2:19) We can see that all these answers make sense. But “But who do you say that I am?” What do we say today, who is Jesus? You can hear different answers. Good teacher. Great religious leader. Founder of Christianity. All of these may sound as plausible answers. This is how people today often try to downgrade what the historical Jesus from Nazareth was. I guess those who consider that Jesus was simply a good teacher have no idea what He was teaching. “But who do you say that I am?” This is the crucial question. Simon Peter replied, “You are the Christ, the Son of the living God.” And Jesus answered him, “Blessed are you! For flesh and blood has not revealed this to you, but my Father who is in heaven. What was so unique about this confession? Disciples already had called Jesus the Son of God. Now Peter called Him the Christ, the Son of the living God. This is so important. Peter called Him the Christ. What did it mean to call Jesus the Christ? Everyone knows that this world is broken and doesn’t function properly. We are broken and don’t function properly. Israel had the promises of God that God Himself will come and restore His fallen creation. We don’t know what exactly people expected God will do. Some thought that God’s solution will involve restoring justice and giving freedom to Israel. Some thought that somehow God will enter the history and will provide ultimate solution against this brokenness. But no one knew how exactly it will happen. The one who will fulfil God’s promises, who will provide the ultimate solution was called the Christ. 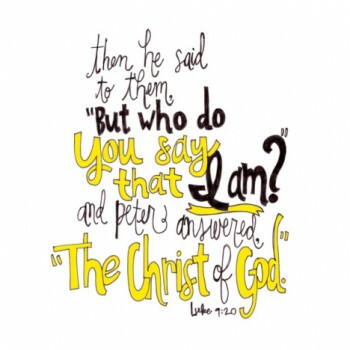 Now Peter said that Jesus is the Christ. That is, that Jesus is God’s ultimate solution to all the problems and evils of this world. His plan of restoration. How does it sound? Reasonable? Difficult to comprehend… But think about Peter and Jesus disciples. What did they see standing before them? Jesus. Their Teacher, their leader. Jewish man with whom they had spent together quite a while. Of course, they saw with their own eyes Jesus doing something unbelievable. Healing everyone. Raising people from dead. Rebuking the storm. Feeding thousands. But still… To say that this man is God’s ultimate solution to all the problems of this world… Universal solution to universal brokenness? If we were asked to guess how will God restore His creation? How will the Creator of Universe restore the Earth? What will be God’s ultimate solution? What would we propose? I think anything, but a Jewish man 2000 years ago. We can see from testimonies of eyewitnesses that Jesus was someone … more than just a man. But to say that He is God’s Christ, God’s ultimate solution for world’s brokenness? That God was in Christ and thus reconciled the world to Himself. That the One through whom everything was created in heaven and on earth, that this one dwelt among us as Jewish man 2000 years ago?! Our reason can’t bridge this gap. By means of our reason we cannot come to this conclusion. Only God Himself can persuade us. It is important to realize it. We can testify about Jesus, His life, death and resurrection, but only the Holy Spirit can persuade someone that Jesus indeed is the Christ, God’s ultimate answer to all our problems, and to all our desires and hopes. But when with the help of the Holy Spirit we trust that God indeed has chosen such unusual way to restore His creation, we become heirs of three wonderful promises. First. On this rock [on this confession about Jesus identity] I will build my church. This is that simple. The Church of Christ is not build in any other way, but only when the Holy Spirit, using our testimonies, persuades people that Jesus indeed in the Christ, God’s ultimate answer to all that we ever may need. That Jesus is the way God the Creator decided to restore His fallen creation. For when we testify others that this Jesus, who lived, was crucified and rouse again two millennia ago is God’s solution against sin, death and devil, then one by one people are brought from darkness into the Kingdom of God. That simple. You don’t need the high degrees to understand this message. Anyone can understand it. Children can understand this. One the other hand, even the highest degrees and the brightest minds can’t comprehend this mystery of God. But this is exactly how the Church is built. When we share with others that Jesus is God’s Christ and when they accept this testimony. When we trust that Jesus is the Christ, the second promise gives us wonderful assurance. “The gates of hell shall not prevail against it [the Church]”. We can rephrase it as ‘the evil powers shall not prevail’. It is so needed assurance. We can easily be depressed seeing that so many of our efforts to build the Church seem to be unfruitful. Even worse. So often surrounding culture is hostile to the message about the Christ and comparing with the splendour and power of this world the church seems so small and insignificant. And people with whom we want to share God’s love, joy and peace seem to be so apathetic. They simply are not interested in anything apart of their belly and comfort. This is how it may look to us. This is about the authority that Jesus gives to His church, to each of you. We are sent with His message. We need to remember, with His message! We can’t alter it. It’s not ours. His message has two parts. Dr Martin Luther called them the law and the Gospel. The law tells what God’s design for our lives is. What are His expectation, His will, His criteria for judging us on the Last day. We need to proclaim the law as clearly as possible. Only then people can know God’s will and see how much we fall short of it. Only then we are willing to hear the second part of the message. The Gospel. That despite our brokenness and the evil that dwells in our hearts, despite our inability to live according God’s standards, He loves us so much that He takes our guilt upon Himself. He nails all the accusations of the law to the cross and offers His forgiveness to everyone who repents and seeks for it. This is how we bind, by proclaiming God’s will, and this is how we loose, proclaiming God’s forgiveness. The wonderful and at the same time scary thing is that what we bind and loose here is bound and loosen in heaven. Our proclamation has eternal consequences. People often think that once they have finished their life here on earth, their good and bad works will be measured. No! Binding and loosing happens here and now. When we don’t live according God’s will, heaven is shat for us. When we proclaim God’s forgiveness and people gladly accept it, heaven is open to them. It happens here! Not that we have this power on our own, but God has chosen to work through us as His messengers. These are three promises that are directly dependent on Jesus identity. If we, with the help of the Holy Spirit, acknowledge that Jesus is the Christ, we are saved. And because Jesus is God’s Christ we can be sure that the evil one will never prevail. And only because the One who sends us is God’s Christ we have this unparalleled authority to bind and loose people by our proclamation. To tell no one that He was the Christ… unfortunately so often we as Christians still uphold this command and tell no one the Jesus is the Christ. Why did Jesus say it? Remember, people at that time had different expectation. Jesus simply didn’t want to stir up unnecessary passions and to sow false hopes. He wanted to wait till His resurrection when God’s plan will be fulfilled. For at that time even His disciples still had no idea what it meant to be the Christ, what Jesus was up to. That’s why this command. Today we know what He was up to. We know that He accomplished His mission. We know that Jesus is the Christ and that “everyone who believes in him receives forgiveness of sins through his name.” (Act 10:43) The Holy Spirit has revealed this truth to us and we are sent to make it know. As I said this is the crucial question – who is Jesus? When we know that He is the Son of God, God Himself, the Christ, the ultimate solution to all our problems, we can’t but share this message. To keep silent is to withhold from others the medicine of immortality. To allow people walk into abyss without warning them. We wouldn’t want this to happen with us. Let us not allow this to happen with others. Jesus is the Christ. The most amazing thing is that He Himself comes among us. He cares for each of you. He knows your names. Almighty God comes to us in the Divine Service to serve us and to bless us. He is here today, and in a minute we will be physically united with Him. We can’t keep this miracle, these good news hidden, we need to share them. Invite your neighbours to dinner, share with them our message, bring them along to our Bible studies, encourage them to see and test and experience that Jesus is the Christ. God’s love revealed. For knowing this truth equals eternal life.